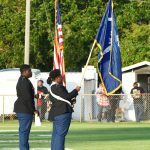 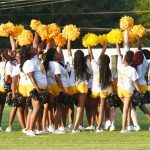 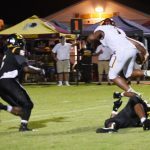 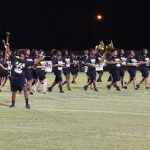 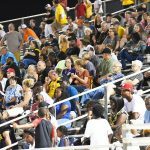 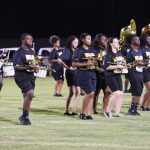 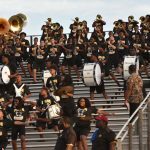 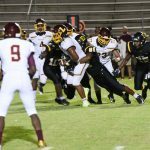 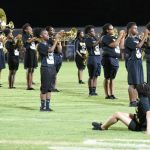 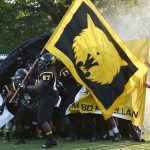 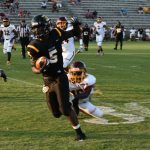 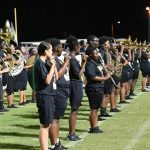 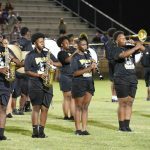 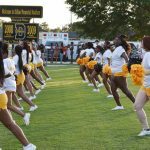 The defending State 3-A Champion Dillon Wildcats scored 35 points in the second half to pull away from the Lumberton Pirates with a season opener 49-20 victory at Dillon Memorial Stadium Friday evening. 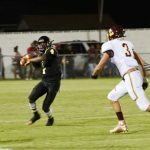 Junior quarterback Jay Lester led the Cats with 236 yards yards through the air in the contest and threw two touchdowns of 48 and 49 yards, while scoring a fourth quarter TD on a QB option pass to close out the scoring. 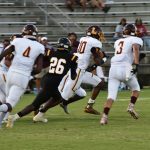 The Pirates fell to a 2-0 deficit on their first offensive play after holding the Cat offense at the one yard line on their opening drive. 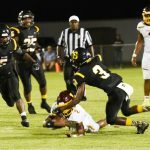 Running back Tazarie Butler was tackled in the end zone by Wildcat outside linebacker Shamar McCollum for a safety. 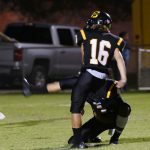 After taking a free kick from the Pirates, Lester was on target with Corrian Wright for a 48 yard scoring toss and new place kicker Malachi Bember’s extra point boot gave the Cats an early 9-0 lead, which didn’t last very long. 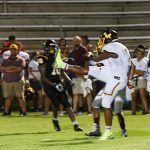 On the ensuing kickoff by Bember, Kwashek Breeden returned for an 80-yard touchdown to cut the lead to 9-6, but the point after kick failed. 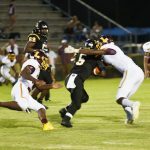 Transfer running back TyQuan King scored the only touchdown in the second quarter by either team, bullying into the end zone from a yard out after Lester found Wright again with a 36 yard pass for a first down on the fourth play of the 43-yard drive to take the ten point lead into halftime. 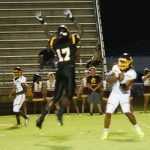 The Wildcats scored 20 points in the third quarter with Lester throwing for a 49-yard scoring pass to sophomore receiver Ahmari-Huggins-Bruce.to take a 23-6 lead to start the scoring with Bember on target with his third PAT. 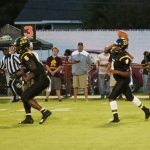 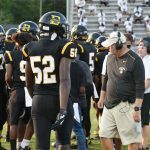 After senior quarterback Braylan Grice led the Pirates on a 73-yard drive with 55 yards through the air to close the scoring gap to 23-12, the Wildcats, on the arm of Lester, had the Cats back in scoring position with a 48-yard completion to Huggins-Bruce, who led all receivers with 110 yards on four catches. 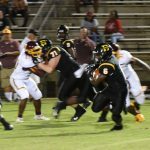 Nemo Squires, up from last season’s Junior Varsity squad ran the final 8-yards on the drive to give the Cats a 30-12 lead with a minute left in the quarter. 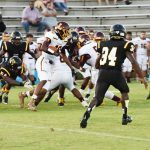 The defense got on the scoreboard just a minute later when safety Justin Green scooped a fumble up at the Pirate 21 and ran it in to lead, 36-12, going into the final quarter. 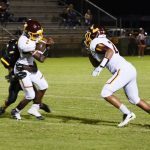 The Pirates got back on the scoreboard on a 7-play drive on their opening drive of the fourth quarter on the strength of a 20-yard touchdown pass from Grice to Breeden, who scored two of the Lumberton TD’s. 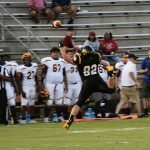 A two point conversion pass between the two was good to cut the lead to 36-20. 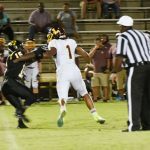 Corrian Wright returned the ensuing kick off 79 yards for his second TD of the game to give the Cats a 43-20 lead with nine and a half minutes left in the game. 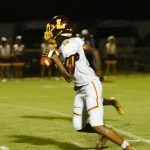 After forcing Lumberton into their forth punt of the contest, the Wildcats marched 66 yards on seven plays with Lester scoring from 12 yards out to end the scoring four minutes later. 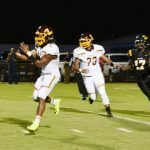 The Wildcats had 236 yards in the air and another 242 on the ground on offense and finished the game with 653 total yards, compared to 90 on the ground and 182 through the air for the Pirates, a much more improved team than last season under the leadership of new head coach Kelly Williamson, who led the Dillon Christian School to back to back state titles before moving on to West Columbia High in North Carolina a few years back. 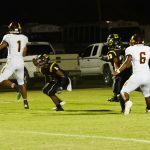 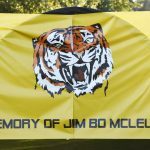 The Wildcats will sit out this coming week with an open date, but will return to action in two weeks against the Latta Vikings at Memorial Stadium.